Bloomberg has been tracking Model 3 production as closely as it can using estimation methods like VIN registrations and social media posts, and the production estimate for total number of Model 3 units made as on September 2, 2018, stands at 81,965. Interestingly, the tracker shows that, while production estimates shot up to over 5,000 in early August and peaked at 6,278 during the week of August 20, it dropped down to 4,588 the following week and is now slightly up to 4,838 for the current week. Assuming that Tesla is averaging 5,000 cars a week, it could mean that August production successfully crossed the 20,000 mark – or very close to it at worst. If Tesla can hold on to that over September, it could mean breaching a 60,000 production mark for the third quarter (Q3). Tesla’s own guidance for Q3 is 50,000 to 55,000 cars, which we think the company will beat by a significant margin. Holding 20,000 for September (we think it will be higher) means that Tesla will be producing its 100,000th Model 3 sometime during the second half of September 2018. That’s going to be a massive achievement for Tesla and for the EV case. That number will cover between 20% and 25% of the reservations made since the Model 3 was open to bookings. Of course, this is just based on Bloomberg’s and our own estimates. One crowdsourced project started by “Troy/Teslike” that covers the Tesla Motors Club and Tesla Model 3 Owners Club estimates 51,821 Model 3s to be produced in Q3. We’re going with our own 60,000+ estimate but, either way, even hitting the 50,000+ range will definitely be an accomplishment worth noting. That sets the bar really high for Tesla to push things even further in Q4. Per the fourth chart above, the jump from Q2 (33,000) to Q3 (51,821) represents a 57% production ramp. A repeat might not be possible considering that Model 3 production is already quite stretched. However, new efficiencies introduced in the assembly lines could give them some added production capacity. A 10% production efficiency over the 60,000 estimate will put our Q4 estimates at 66,000 units; at the 51,821 figure estimated by the crowdsourcing effort it will be 57,000. As such, Model 3 production numbers in Q4 are expected to be between 57,000 and 66,000 units. We think it will be closer to 66,000 units or beyond, as long as Tesla hits the 60,000+ goal in Q3. But what if you wanted to be really optimistic and take that production efficiency factor up to 33% or more, as Tesla earlier this year indicated has been achieved with Model S and Model X? If we take the 60,000 figure for Q3 and add a 33% increase, we arrive at an estimate of nearly 80,000 Model 3 units produced for Q4. 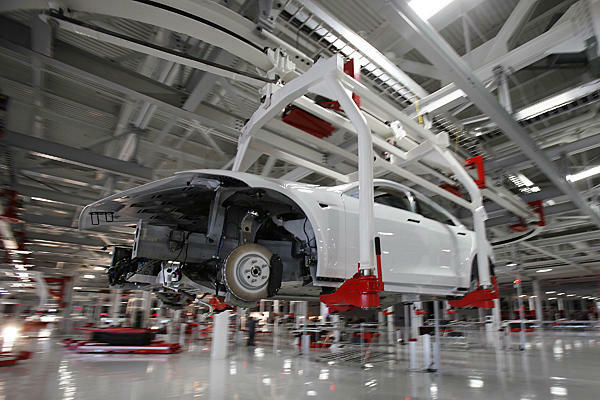 However, we have to keep in mind that any efficiencies unearthed during all the years that the Model S and Model X have been in production will have already been brought over to the Model 3 assembly line. So, we think that a 10% increase is more realistic because in a recent YouTube interview Musk clearly said that there was still a lot of opportunity to reduce per-car production time. The only reason Tesla may not meet our higher-end estimates is if it deliberately slows down the line to make sure it can handle the rigorous self-imposed quality tests at the same pace as general assembly. 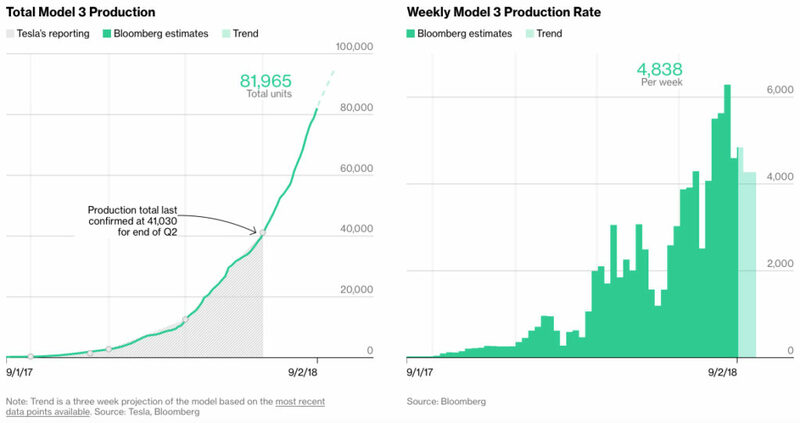 That could be one reason why Bloomberg’s numbers for the past two weeks are much lower than the 6,278 peak production number that Model 3 achieved that one week in August. In summary, Model 3 production estimates for Q3 currently stand at between 51,000 and 60,000+, and Q4 estimates at 57,000 to 66,000+. But we won’t be surprised if Tesla beats those numbers for both quarters if they figure out how to speed up the quality checks without compromising on thoroughness. Either way, we’re confident that the 100,000th Model 3 from Tesla will be rolling out of the Fremont factory within the next 3-4 weeks. Let’s wait and see.